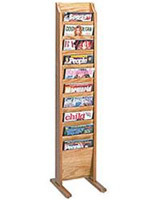 This business magazine holder for retail and professional use is affordable due to its one-sided, oak construction. 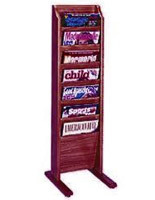 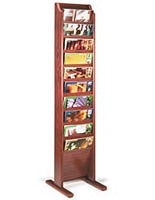 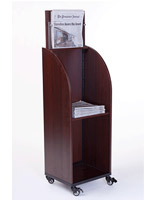 The free standing store fixture features (7) pamphlet holders on one side and a slim profile. 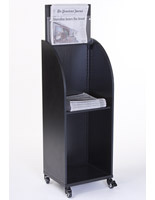 This business magazine holder’s light golden finish complements its contemporary design and has an eye-catching presence on any showroom floor! 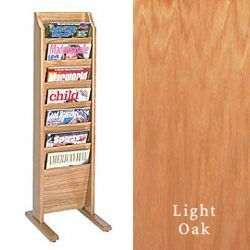 This seven pocket system fits letter-sized publications that are 9" wide and 3/4" deep, and the slots are angled so titles are visible from a distance. This magazine holder that is an information dispenser is a must-have in an office, hotel, hospital environment where clients waiting for services like to read. 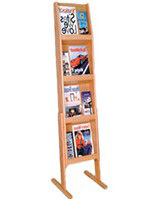 A screwdriver is required to attach the feet to this easy-to-assemble unit.